One of my favorite things to do with savory dishes is to add a sweet element to them. 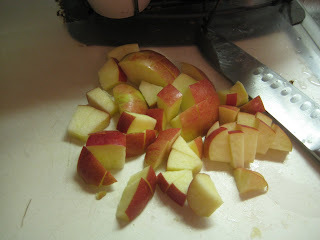 I love the classic combination of pork and applesauce, but wanted to update it with fresh (not jarred) ingredients. 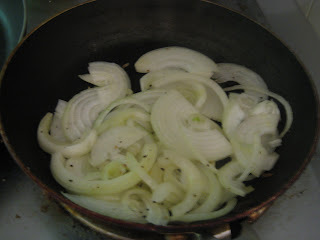 I started by caramelizing some onions in a frying pan in a tiny drop of oil. 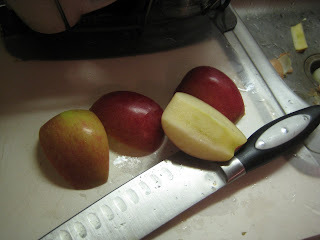 I wanted the apples in a medium dice, so they would soften a bit, but still maintain their sweet crunch! Here they are -- all sauteing together. 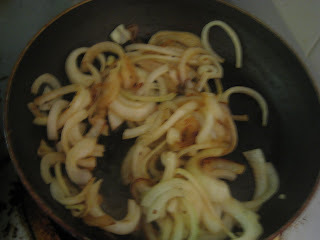 I added salt, pepper, a half teaspoon of sugar, and a splash of cider vinegar, and cooked it all down until the onions were caramel in color. While the onion/apple mixture was cooking on the stove (and some previously blogged oven fries were baking in the oven) I got started on the pork chops. 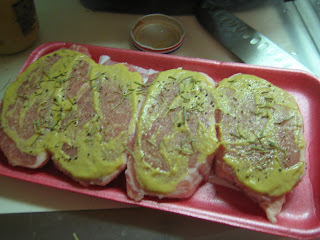 I started with salt and pepper, then rubbed the chops with some Dijon mustard. I followed this with a bit of rosemary (i LOVE pork with rosemary). I pan fried the chops in a hot pan so they would get a crust on them. I didn't think this through entirely though, because the mustard (and all the delicious rosemary) stuck to the pan....For a moment I was devastated....but then a little light bulb went off. I cooked the chops until they were just cooked through, then took them out of the pan. I then de-glazed the pan with a little chicken stock and a splash of white wine to make a pan sauce. I put the chops back in for a minute just to coat them...and it saved the day. 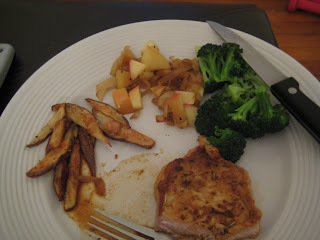 Dinner was delicious...The apples/onions were a perfect slightly sweet compliment to the savory chops...and the requisite oven fries and organic broccoli rounded out the meal.